When a friend asks you to be the photographer at her wedding the butterflies start to twirl in your stomach with excitement and nerves. It's always so much harder photographing people you know well for me. However I was truly happy to be doing it and as I love everything about weddings and as I saw Lou reguarly I was privy to all the planning too :-). 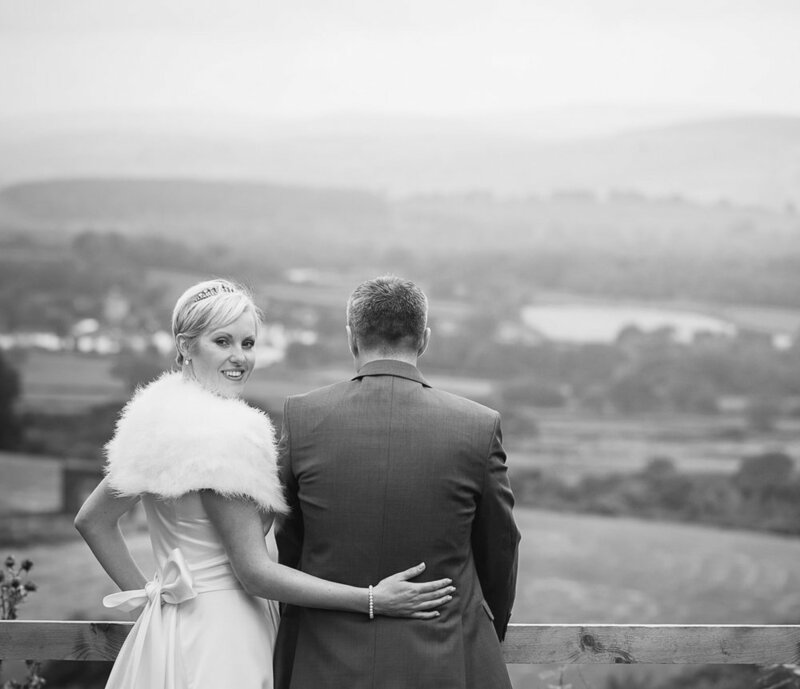 WOW, this wedding didn't disappoint, a home made intimate affair with a ton of class. Lou is one of the most creative and determined people I have ever known and she wanted to put herself into the wedding as much as possible. She more than succeeded! Not only did she make Hazel's bridesmaid dress, she hand crafted every single flower on the cake, which looked so realistic, like real flowers! 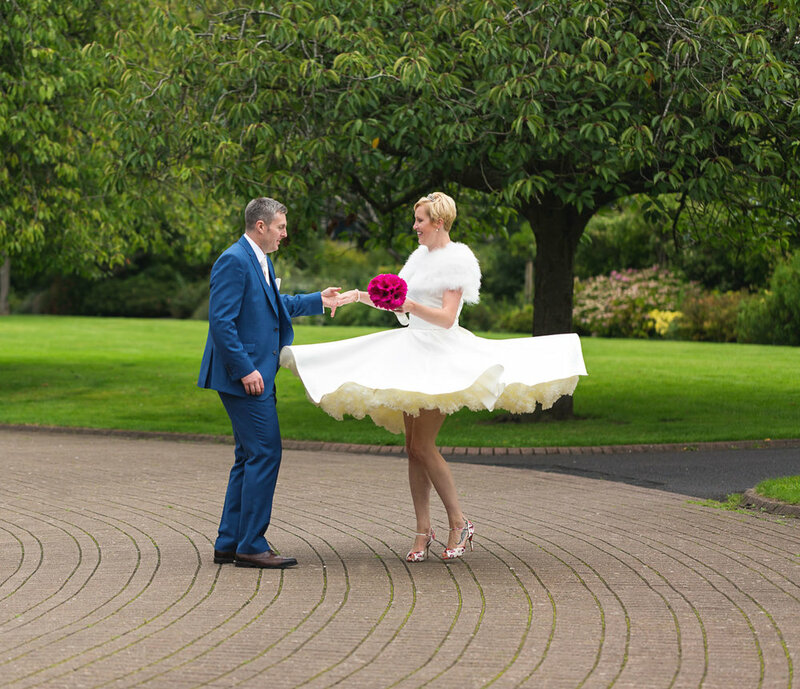 Kath, Lou's amazing mum is also very creative and as well as making the fruit cake base (a few years ago), she created Lou's incredible 1950's inspired full circle wedding dress and also had time to make her own dress!! The wedding had an Audrey Hepburn feeling going on... I was loving it! 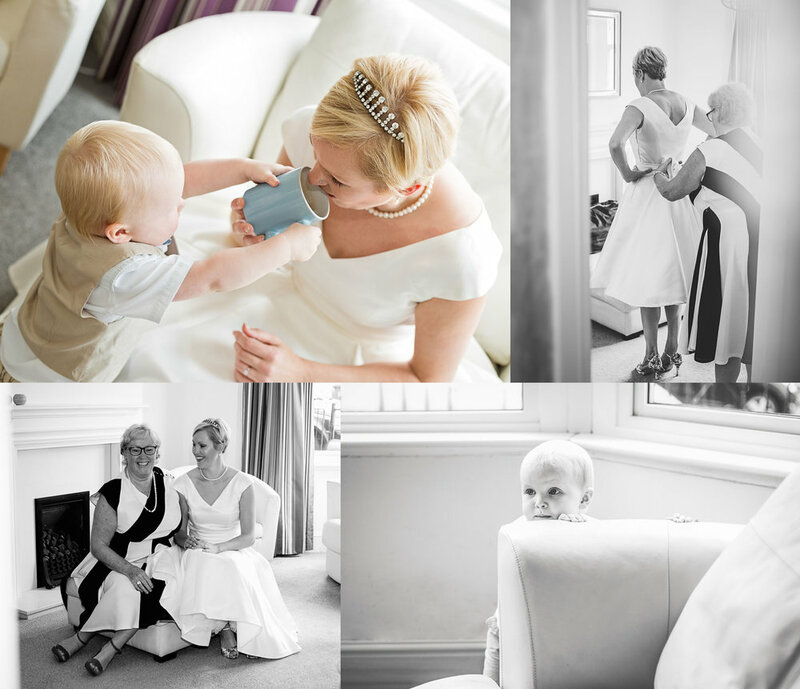 I arrived to a very chilled out bride to be and her mum eating breakfast about 9am. Only the 2 of them there plus one and a half year old Finbar. Whilst Lou was getting ready I was taking detailed shots of the dress and amazing pink floral shoes (which I helped Lou find whilst on a shopping trip in Cardiff) and Finbar was parading around in a bright pink fascinator he'd picked up.. so cute. I arrived at Cardiff City Hall just before Paul and his family, who had flown over from Ireland. 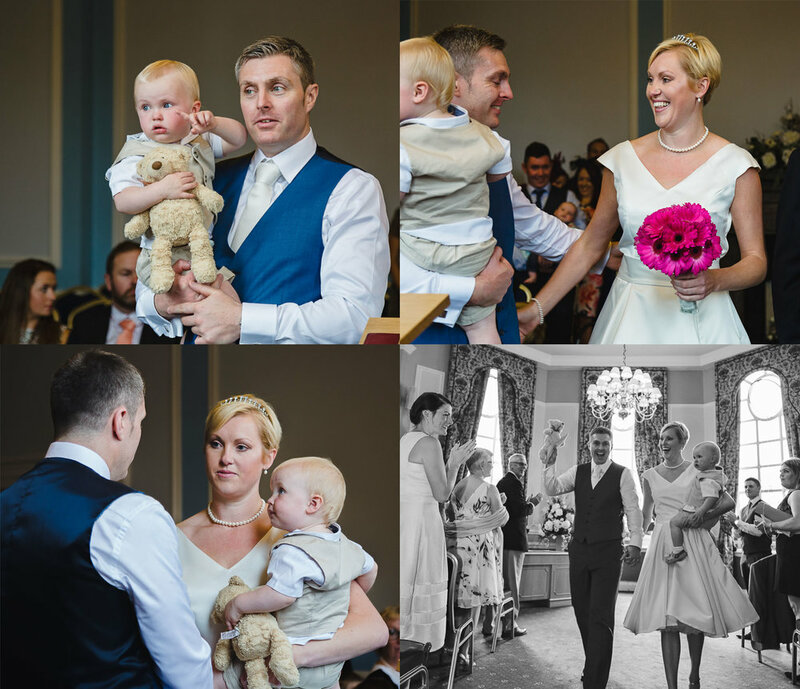 The ceremony was perfect, a marriage of the 3 of them- Lou, Paul and Finbar, who didn't leave mum's side throughout the vows. 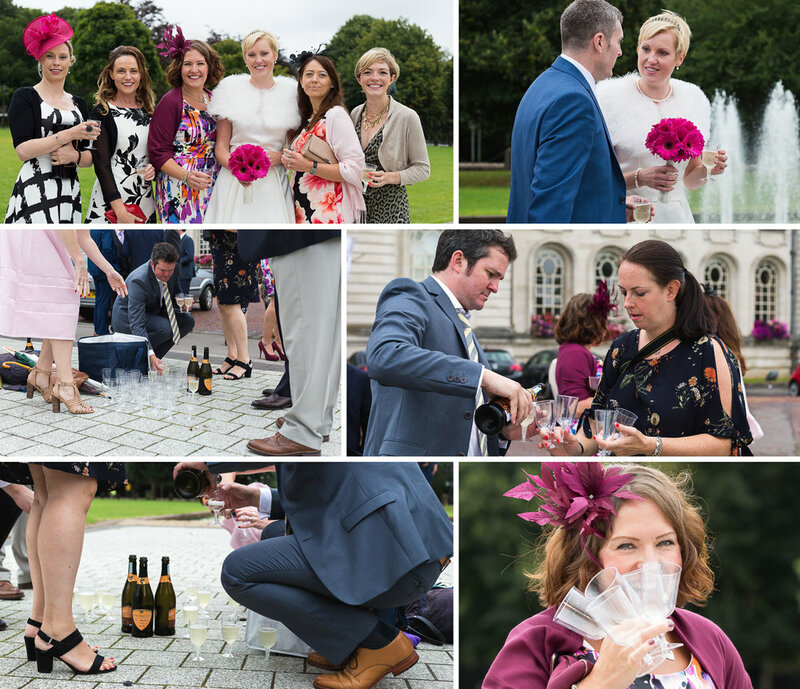 Outside City Hall in true Celtic style friends of the bride & groom collected a hamper full of champagne and plenty of picnic flutes from Kath's car and the bubbles were flowing. It was lovely. The heavy rains stayed away and everyone was so relaxed and mingling with each other... a really lovely bunch of guests. 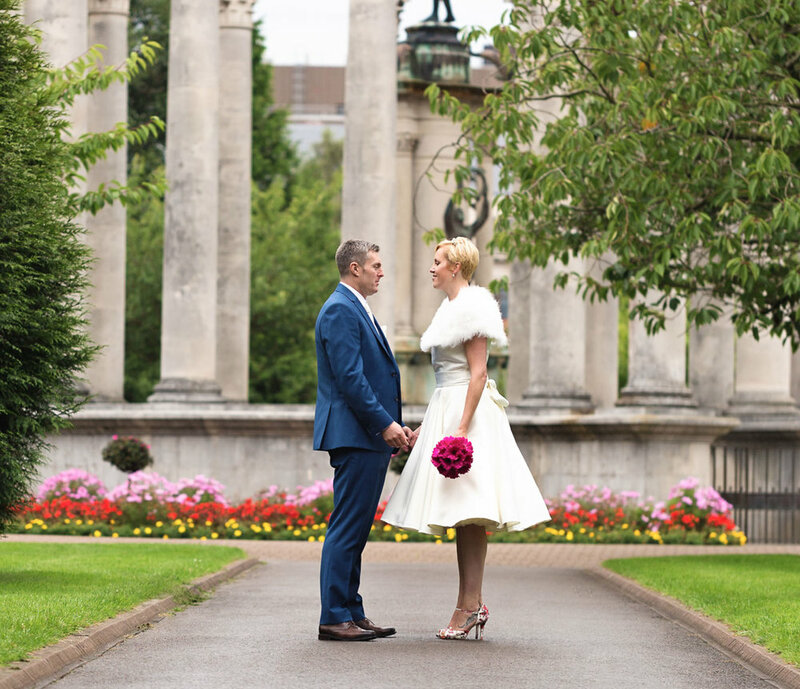 Before the reception in Cottrell Golf Club in the Vale I whisked the B&G away to the gardens behind City Hall.. September flowers out in bloom, it was gorgeous, colourful and bright, despite a few drizzles from the rain (though what a great excuse to take some romantic umbrella shots!). There were a few members of the public in the park though this didn't stop Lou & Paul having a little dance, showing off the twirls in her skirt, and practicing for the evening's First Dance! I was surprised that we were the first people to arrive at the golf club, and the manager was a bit shocked too lol. Lou reassured me that they wanted to arrive before everyone else so they could see the room all done up and have a moment together - it looked magnificent! They ordered a cup of tea and had one of gran's home made heart welsh cakes... yummy! I was also able to sweet talk the manager into letting us venture out by the pond for some pictures, which initially wasn't allowed until after play, yeay! They had decorated the room the day before with loads of colourful paper lanterns in different sizes, Paul's idea and influenced from a trip to Thailand. The tables hosted gerberas in pink, orange and yellow and each table was named after a type of tea. For a few years Lou had been collecting vintage china cups, saucers and plates and all the crockery belonged to the bride. It was gorgeous, all mismatched with a real feel of a classy afternoon tea party. And the food didn't disappoint! Provided by Spiro's, it was delicious (yes I was fed and was sat with mutual friends as I was also a guest). Mini sandwiches followed by mini pork pies (they were massive actually and packed with loads of meat), cheese and tomato tartlets, barabrith, welsh cakes, chocolate brownies and of course scones with clotted cream. Those that know me know well that I love afternoon tea and couldn't actually finish it! The speeches were great with lots of laughs and there weren't any tears that I noticed apart from one I spotted in Kath's eye as Paul was thanking her for all her support and hard work. Dean, Paul's brother and best man did a brilliant job and didn't complain when I asked him for help gathering people for the group shots. Thanks Dean, you were a star! The rest of the day was brilliant, Cottrell Golf Club has stunning views, as well as the pond which at this time of year has amazing purple flowers at the forefront. It's a gorgeous place for a wedding, and often overlooked I think. The staff were fantastic and really helpful too. Lou & Paul were a fantastic couple to work with, we had so much fun and it didn't feel like work for me at all. Their first dance was perfectly fitting for them as a couple and Lou's style and dress... no smooching for these two, instead to Queen's 'Crazy Little Thing Called Love' they jived away, kicking up a storm on the dance floor, only to be joined by most of the wedding guests 2 thirds of the way through the song.. just brilliant!